Standing water of swamps, forest pools, ponds, ditches, marshes; very local northwards. 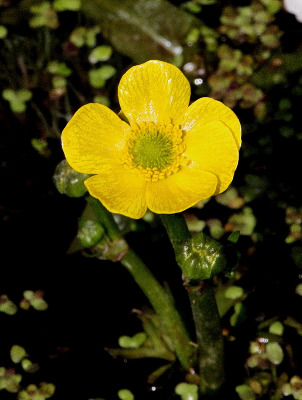 Even in the absence of the distinctive corky-winged achenes, this species is usually easily distinguished from R. gmelinii by its larger size, especially in the flowers but in general also in foliage (although the submersed leaves of R. gmelinii may be quite large, usually with segments broader on the average than in the finer submersed leaves of R. flabellaris). Flowers produced at the end of the blooming period are sometimes unusually small, resembling those of R. gmelinii. At this time, however, copious fruits will be available to see the distinctive large, long-beaked achenes. Plants of both species produce smaller, less limp, less extensively lobed leaves when stranded on moist shores than they do when submersed. This is a showy, large-flowered species, and ponds full of the bright yellow flowers in mid-May, before anything else in the adjacent wet woods is in bloom are very eye-catching. MICHIGAN FLORA ONLINE. A. A. Reznicek, E. G. Voss, & B. S. Walters. February 2011. University of Michigan. Web. April 22, 2019. https://michiganflora.net/species.aspx?id=2389.